Our Boston Handmade annual meeting took place last weekend and one of the highlights of the meeting is the gift exchange. The gifting is anonymous so you never know who your contribution might wind up with. 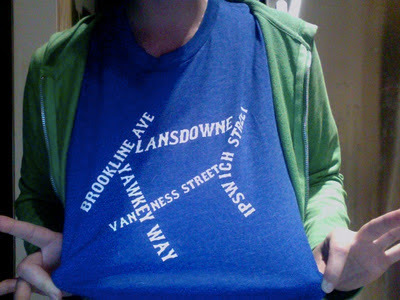 I picked this sweet silk screened t-shirt by Evan Webster. 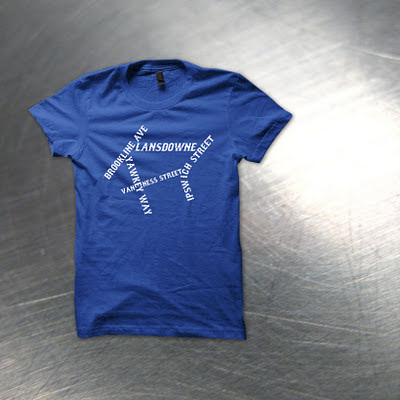 It is part of his series of shirts of streets that make up various neighborhoods in Boston. This one is Fenway! Which could not be more perfect for me. :) I love the color as well as the design and it's also super comfortable. Very cute t-shirt! You have been awarded the "versatile blogger award" on my blog http://yarnobsession-2.blogspot.com, come check it out! That looks like an awesome shirt. Thank you very much for sharing it. That shirt would really look good if you match it with some clarks shoes, especially if wear some khaki on. I love my printed t-shirts on black and light blue ink. I do even paint some of my t-shirts with glow-in-the-dark paint. Assuming that you are paying special mind to an extensive variety of whale based themed T-shirts and different items, the entryway Whaleworld.co.uk is one of the best place to depend. Here you can uncover an extensive variety of items at the most aggressive costs.